Built in 1793 the San Felipe de Neri Church has been the spiritual and cultural heart of Old Town for 207 years. It is the best-known symbol of the city of Albuquerque. This project consisted of restoring the steeples, the south pediment, and the entry vestibule of the church as well as re-roofing the main church building. 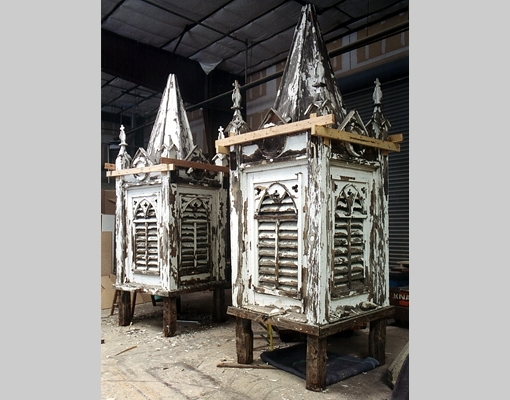 It also included designing a way to perform regular maintenance of the painted wood spires at the top of each steeple. This maintenance is critical. However, because the cost to erect scaffolding to perform this maintenance is prohibitive, the painted wood spires had not been maintained in thirty years. In response to this problem and to facilitate future maintenance Anthony Anella Architect re-designed the connection between the wood spires and the bell chamber so that the spires could be removed easily from the church by crane (the cost to hire a crane for a day is significantly less than the cost to erect the necessary scaffolding).